Let’s Get This Dog Book Party Started! 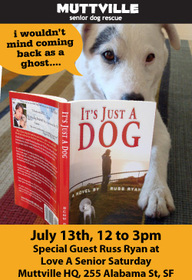 If you’re in the SF Bay Area tomorrow (July 13), pop on by the Love A Senior Saturday / Muttville Dog Book Party. There will be books, there will be dogs, doggie photographers, a doggie kissing booth — honestly, it’s just too much fun to cover in a single dog blog post! And the best part is that 100% of sales go to Muttville Senior Dog Rescue. ← Eloise Would Like A Dog, Please!